300C SERIES - (8-CYL) - The third version of the 300 continued as the fastest and most powerful production car in the country. The 300 featured full leather interior trims and a new, masculine grille unlike that seen on any previous Chrysler offering. Exterior ornamentation was kept to a minimum with single spear-like moldings on the lower rear quarter panels. The round 300 medallion, with a red-white-blue background and model numbers and lettering made its debut. Two medallions were placed on the side spear, one each on the hood, deck lid, glove box. Only the two on the spears carried both numbers and letters, the others had only the '300' designation. 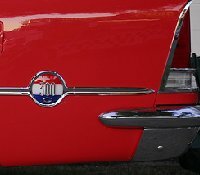 The colors of the emblem were claimed to be representative of the high performance nature of the American car buying public. With smaller, 14 inch wheels being used, it was found necessary to provide for additional brake cooling on the Chrysler 300. This was accomplished by adding a rectangular opening below the headlamps which admitted air and guided it, via a duct, to the front brakes. 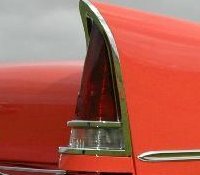 Monotone colors were used exclusively on the 300 and the front did not have the short, narrow vertical bumper guards found on other 1957 Chryslers. The 300s were considered a part of the New Yorker series, but were actually a world apart from most other U.S. production automobiles of the day. 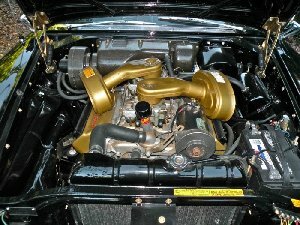 A new 392 cid Hemi V8 with 375 bhp was the standard engine for 1957 in the 300C. An optional high performance version with a more radical cam, 10.1:1 compression (instead of 9.25:1) larger exhausts and a manual transmission (390 bhp) was available. 18 of these were built. A convertible model was also offered for the first time was. 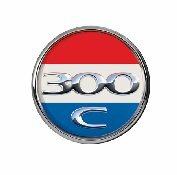 A patriotic American theme was used on the 300 badging with six red, white, and blue "300" medallions and the wheel covers had a red finish painted in the depressed outer layers of the covers. 300C SERIES - (8-CYL)- The third version of the 300 continued as the fastest & most powerful production car in the country. The 300 featured full leather interior trims & a new, masculine grille unlike that seen on any previous Chrysler offering. Exterior ornamentation was kept to a minimum with single spear-like moldings on the lower rear quarter panels. The round 300 medallion, with a red-white-blue background & model numbers & lettering made its debut. 2 medallions were placed on the side spear. 4 on each hubcap, one each on the hood, deck lid, glove box and another within the steering wheel center hub. Only the 2 on the spears carried both numbers & letters, the others had only the '800' designation. The colors of the emblem were claimed to be representative of the high performance nature of the American car buying public. With smaller, 14 inch wheels being used, it was found necessary to provide for additional brake cooling. This was accomplished by adding a rectangular opening below the headlamps which admitted air & guided it, via a duct, to the front brakes. Monotone colors were used exclusively on the 300 & the front did not have the short, narrow vertical bumper guards found on other 1957 Chryslers. The 300s were considered a part of the New Yorker series, but were actually a world apart from most other U.S. production automobiles of the day. 300 C.I.D. NUMBERS: Serial numbers and motor numbers were in the same locations as on previous models .Serial numbers were 3N57-1001 and up. Engine numbers ranged from 3NE57-1001 to 3NE57-3338. All production of Chrysler 300s was quartered in Detroit. 300C SERIES ENGINE V-8. Cast iron block. Overhead valves with hemispherical combustion chambers. Displacement: 392 cubic inches. Bore and stroke: 4.00 x 3.9 inches. Compression ratio: 9.25:1. Brake horsepower: 375 at 5200 R.P.M. An extra-cost engine developing 390 brake horsepower at 5400 R.P.M. was available with stick shift and no power options. It had a 10.0: I compression ratio, four-bolt cast iron exhaust headers and a 2-112 inch,, low back-pressure exhaust system. Solid valve lifters and twin four-barrel carburetors were used. CHASSIS FEATURES: Standard shift standard on Windsor. Torqueflite optional on Windsor; standard on Saratoga, New Yorker and 300C. Wheelbase: 126 inches. Separate body and frame construction. Hotchkiss drive. Hypoid rear axle. Toal-Contact brakes. Overall length: (Windsor, Saratoga, New Yorker and 300C) 219.2 inches; (Town & Country Wagon) 218.9. Safety wheel rims. Tires: (Windsor and Saratoga) 8.50 x 14; (New Yorker and 300C) 9.00 x 14. Front tread: (Windsor and Saratoga) 61 inches; (New Yorker) 61.2 inches. Rear tread: (Windsor and Saratoga) 59.7 inches; (New Yorker) 60 inches. Width: (all models) 78.8 inches. Torsion bar front suspension. CONVENIENCE OPTIONS: Power steering on Windsor (standard on other series). Hand brake warning signal option on Windsor. Backup lights optional on Windsor. Dual head lamps (became standard on all lines shortly after production commenced). Air-Temp air conditioning. Power brakes. Power windows lifts. Six-Way power seat. Whitewall tires. Nylon tires. Chrome stainless steel wheel covers on Windsor. Radio with Music Master or Electro-Touch tuner. Dual rear antennas. Power front antenna. Rear seat speaker. Fresh air heater. Instant Air heater. Two-tone finish. Tinted glass. Rear window defroster. Windshield washer. Undercoating. Non-slip differential. Outside mirrors. Full-flow oil filter on Windsor. Captive Air tires on Town and Country station wagon. Hi-Way Hi-Fi phonograph.